Hot Togs love the outdoors. But keeping warm can be a big and expensive problem – one which Hot Togs have set about trying to solve. 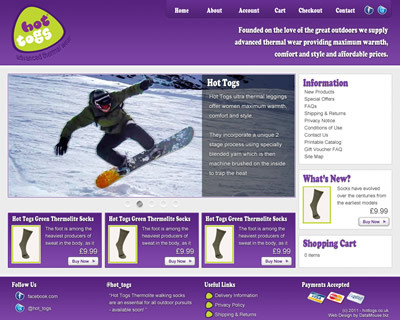 Hot Togs required an update to their existing static site, which would allow customers to place orders through teh site whilst also allowing an administrator to maintain content. The site is fully automated – taking payments and creating shipping paperwork automatically. It’s sock-tastic!